I stayed over by the corner. A host of other chickens were over the other side getting acquainted. It seemed so easy for them. I smiled over and watched as a crowd of people gathered outside to look in. Raising an eyebrow I thought how the other chickens probably thought I was distant and now I was on display for all these people to decide I was too. How fun! Taking some tentative steps I feel a plastic egg against my foot. It is multi-coloured, mostly pink and yellow. Another chicken who I learn is called Susie jokes that she laid it this morning and comes over to engage me in conversation. She is rather beautiful and I am suddenly even more shy than I was before. “You’re the singing chicken, right?”, she asks. “I sing a little bit.”, I admit. I find myself blushing slightly. “Is that a …”, I begin but trail off. “Yes. That’s a date.”, she giggles. 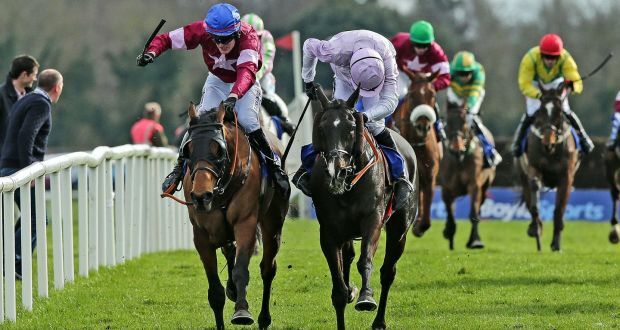 The Mouse Morris trained Rogue Angel became the latest winner of the Irish Grand National at Fairyhouse Racetrack today. Winning at a starting price of 16/1 Ger Fox helped guide Rogue Angel home after leading from the start just holding off the Gordon Elliott trained Bless The Wings ridden by Ruby Walsh who was 12/1. Third place went to 33/1 shot Ballyadam Approach with fourth going to Folsom Blue, Rogue Angel’s stablemate. My Tips For The Irish Grand National 2016! The trip will suit Baie Des Iles. A really strong horse with a really good chance of success today. Folsom Blue is a horse I’ve always liked. Quite underrated but hard-working and has a definite chance in this race. You can’t really pass last year’s winner and if this horse did the double it wouldn’t shock me. This horse has a good chance. There is definite potential of Kilford coming close to glory or possibly even winning the race. This horse has always been a good horse and I still believe there’s a lot of talent still present. Raz de Maree could make a winning return today. The first live show of BBC show The Voice UK took place last night and the last ten performed for the first time live following two finalists Chloe Castro (from Team Ricky) and Beth Morris (from Team Paloma) leaving the show. It was a mixed bag of performances but Jordan Gray (from Team Paloma) stole the show with her amazing rendition of Florence & The Machine’s Shake It Off. Proceedings began with Team Will and the first singer on his team to sing was Lydia Lucy. The song didn’t really suit her. I don’t know if her vocal is very distinctive and personal taste wise I probably prefer singers that you switch on a record and you know it’s them without knowing they have a track out. I don’t know if I find that with Lydia’s vocal which isn’t to say by any means she can’t sing but I think she needs to find a song that makes her stand out more and while I love this song it wasn’t the song to do that. Lyrickal’s performance wasn’t great vocally but I appreciated that he tried something new that we hadn’t seen him do on the show before. The emotion with which he sang the song was great. It pains me to say it but this didn’t work. The song kind of swallowed Lauren’s vocal up and it didn’t really suit her but she did Ireland proud by getting to the quarter finals. Not everyone can say they got to that stage and we’re very proud of her. If Heather had have been on another team last night she probably would have got the fast pass into the semi-final because she was in the top three performances on the night so it was great she got through on the public vote. She sang this song beautifully and her piano playing was stunning too. Oh and the piano and dress co-ordination was quite cool too. She is definitely a dark horse to make the final next week. Everything was perfect about this performance by Jordan Gray. Her vocals were on point, the staging was incredible and she looked amazing. She’s a natural performer and a true artist and she’s put herself in a great position to win the entire contest after her performance last night. There is no doubt that Kevin has a great voice but he has sung all ballads throughout the contest so far and last night he did another ballad. He sang it very well but it was very much in his comfort zone. In saying that a singer can sing anything and I’m glad he has the chance to come back next week and show that he can do something different because I believe he is more than capable of doing so. Jolan sang Yes by Mc Almont & Butler and he did a really good job on the track. Jolan was definitely in the top three performances on the night and has really set himself up as a contender for voice glory. If it is to be our 3rd male winner in a row I think it might be Jolan who wins. This didn’t really work unfortunately. Harry has a great voice but it was a big ask to perform a David Bowie track in the first live show. David had such a storytelling vocal and that was missing so it wasn’t the right song but he is a great singer. Another huge song for a first live show. It didn’t suit Vangelis’ vocal but I’m glad he has the chance to come back next week because he has had some good performances up to this point. Cody was really good on the chorus of this song but on the verses her vocal sounded a bit low. It wasn’t her best performance on the show but I’m sure she’ll come back fighting next week in the semi-final because she’s really talented. Below is the performance by the coaches and the performances by the guest performers Stevie McCrorie and Years & Years. My sister and I recently went to an event as part of the 1916 events in Bray library. It took place on March 23rd and was entitled, ‘North Wicklow and the Easter Rising – not a bullet was fired’. It was really interesting. Sponsored by County Wicklow Library Service and Bray Cualann Historical Society, many leading figures and less known figures connected to the 1916 Rising were discussed by historian Brian Hughes as well as all the various connections to North Wicklow. There is a great assembly of photographs from the time of the various faces associated with the Rising as well as many of the places in Bray as they were at the time. There was an interesting photograph of two volunteers pretending to be tourists which gives an insight into the dangers people faced at the time if it was discovered that they were volunteers. The Proclamation is also discussed and how you would know the original because they had no letter Es to put in it so they used an F instead and put a bit of tape at the bottom of it. There was also an interesting overview of the times running throughout the talk. I know it was different money back then but my sister and I did have to smile when he said that £1 would get you 600 cigarettes back then. There is another chance to catch the talk at the Powerscourt Arms Hotel in Enniskerry on Thursday, April 14, at 8.30 p.m. The Voice UK finalist Jordan Gray recently did an interview with Gemma McCartney for British celebrity weekly Star Magazine with photos by Rex/Shutterstock. In her very articulate and at times witty interview the 26-year-old Essex lady, whose stage name is Tall Dark Friend, talks about her girlfriend Heli, why she auditioned for The Voice instead of rival talent contest The X Factor, the reception she has got from the public since appearing on the BBC talent show, what Paloma is like as a mentor, her amazing sense of style and what winning the contest would mean to her. Humanity In The Face Of None is a poem I have written about the horrific attacks in Brussels. May everyone who lost their lives rest in peace. That it could have been us or someone we love. Love in the face of hate. Rest in peace to all those who died in Belgium.